Sydney Theatre Company presents FRANKENSTEIN. Created by Lally Katz, Ralph Myers, Stefan Gregory. Based on the Book by Mary Wollstonecraft Shelley. Performed at Wharf 2. Mary Wollstonecraft Shelley, British novelist was the daughter of the rationalist philosopher William Godwin and the feminist writer and radical Mary Wollstonecraft and became the second wife of Percy Bysshe Shelley. She wrote FRANKENSTEIN OR THE MODERN PROMETHEUS in 1818. It is essentially about a man who created a monster. Ralph Myers (the Director) and Lally Katz (the Writer. This is the first work of hers that I have seen performed. Very exciting.) believes that "the story has taken its place alongside the Greek Myths and the tales of the bible in the canon of great stories, destined to be re-told - and bastardised - over and over again." For most of us, the famous James Whale film of FRANKENSTEIN (1931) is part of our vivid story heritage, to be followed by THE BRIDE OF FRANKENSTEIN. (In the program notes this creative team acknowledge the ABBOTT AND COSTELLO MEET FRANKENSTEIN farce, and it sticks fairly powerfully in my mind, too, as one of the best times I had at the pictures as a kid.The drug-addled Ken Russell film about the night this story was first created, GOTHIC, also swims around in my memories) Ralph Myers and Lally Katz go on to say "We have not attempted to tell the whole story...... The details and scenarios of our version are often dramatically different to those in the novel but at the heart we are telling the same story. We have followed the essential core: A human makes another human. Then things go wrong. Shelley's creature is articulate, sympathetic and reasonable. Its creator, Victor is none of these things. Shelley seems to us to clearly identify with the monster. Is the creature a self-portrait?" At the end of this performance I was asking: Is this Frankenstein a self-portrait of a generation of humans about to inherit the responsibility of the world as they have been left it? What Mr Myers and Ms Katz and this creative team have done is create a little gem of the theatre. Certainly no monster, rather a great treasure, and while Mr Myers may have been "grappling with the creation of horror, and the horror of creation" (so the production pre-publicity card tells us) he can be rest assured, in my view, his creation is magnificent. When you enter the theatre, about a third of the seats are occupied by life size dummy figures made of foam rubber and dressed in pastel coloured under-suits with simple facial decorations: X T for eyes etc. They sit separately or holding hands or with arms draped around the shoulders of their neighbours. There is a front black curtain. The lights dim, two performers, in white pants and long sleeved polo necked outfits, enter, pull back the curtain to reveal a slumped figure of Victor Frankenstein (Benjamin Winspear) in front of a white sheeted bed. One of the white suited actors, (who have helpfully printed across their back shoulders their principal task ie Writer, Composer, Props Maker) hold up a title board that announces the scene FRANKENSTEIN CREATES MONSTER, a little sound pings and the action begins. 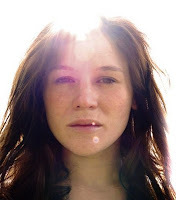 A circular collection of light bulbs brightens on a gesture from Victor and slowly the sheet begins to rise and finally levitates into the air to reveal the sleeping creation (Yael Stone). It comes to life and leaps from the floating bed (a piece of Magic by Simon Cavanough) in a coiled womb pose onto the upper body of Victor. A figure in white enters with another title board VICTOR REJECTS CREATURE. The sound pings again, and the next scene unfolds. This is the modus operandi of the story telling technique. (It reminded me of the device of the little singing mice in George Miller's film BABE who announce the next chapter of the story, and is similarly Brechtian in effect and totally charming.) The story moves through the discovery of the creature's ugliness, the loneliness, the demands for attention, the acts of revenge, the creation of a partner, the revelation of its inadequacy, the murder of Victor's bride, Elizabeth, and finally the demise of Dr Frankenstein and the plaintive state of the creature alone in the world facing an uncertain future. The writing of the scenes have the feel of a story being told to children.It has the atmospheric composition of a sophisticated moral fable that say, Oscar Wilde or Angela Carter have. Child like but definitely adult. It is both comforting in its familiarity and stirringly stimulating in it's contemporary story telling technique and point of view. The acting of the two principal actors (Benjamin Winspear and Yael Stone) is simple and naively articulated. Alongside the white suited non-actors, who occasionally take on verbal roles with the principals, they appear enormously sophisticated. (Well, after all,they are actors and have better developed performance story telling skills then the writers, musician and prop maker!!) The white suited story assistants play in what I take to be a deliberate style of child like selfconsciousness. It is a totally disarming technique. The feel is kind of SOUTH PARK without the vulgarisms. Charming but disturbing. 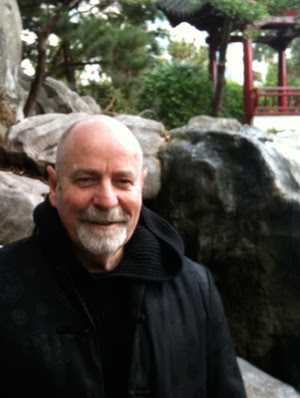 The Music and Sound Design (Stefan Gregory) is simple and the lyrics and score played by Mr Gregory on stage, on the piano, are deftly and mesmerisingly, successful tools of the overall tenor of the piece. The Lighting (Nick Schlieper) as usual flawless, both technically and creatively. The glorious glacier white, growing gently in intensity in the last scene, both metaphoric and beautiful. Here, at last, in my experience of the New Work season in Wharf 2 this year, 2008, is a fully realised work. Ms Katz and Mr Myers are responsible for the choices in the adaptation and the text, and they are remarkably simple but monumentally clear and powerfully potent. All of the collaborators, Benjamin Winspear, Simon Cavanough,Nick Schlieper, Stefan Gregory, Joshua Emanuel, Matt Schubach, Ralph Myers, Lally Katz, Terri Richards, and Yael Stone (All can be seen hilariously spoofing the classic Karloff performance in the 1930's film in the program photograph) seem to me, have applied intelligence, integrity, wit, vision, ingenuity and a passion for expression through the performing arts with an apparent homogeny of high intention that would be hard to find surpassed this year in the Sydney production calendar. Here, is a collection of relatively young artists (excuse me Mr Schlieper) who are making a wise and impassioned statement about our times. The heart-aching last song and moments, of this young modern Frankenstein Monster singing a "birthday song" beside the dead body of her dead creator, Victor, was remarkable both for the tragic pathos of a world, now being given to the young "monster", that she has had no encouragement or guidance to solve. It was truly an apocalyptic moment in the theatre for me, both for my world view, and for my hope and now my belief in the future of the Australian Theatre. I was saddened by these young artists predicament in a contemporary culture that seems to have heartlessly created them and abandoned them (but not by the STC!! ), and yet entirely heartened and and excited by seeing worthy heirs of their culture, making such a mature investigation and statement. And have hope. All power to this company of Artists. The piece is all of only 40 minutes long and is certainly worth catching. Playing now until 13 December. Book online or call 02 9250 1777.